If the quality of an education system can never exceed the quality of its teachers, then countries need to do all they can to build a high-quality teaching force. 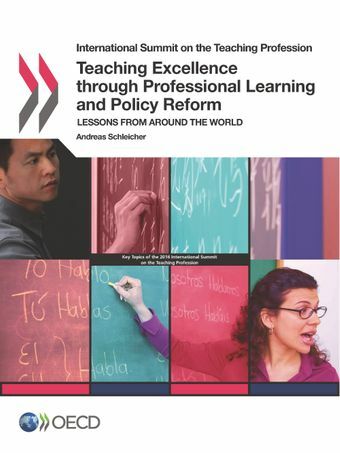 Teaching Excellence through Professional Learning and Policy Reform: Lessons from around the World, the background report to the sixth International Summit on the Teaching Profession, describes the knowledge, skills and character qualities common to the most effective teachers. It examines the education policies and practices that help teachers to acquire these tools, including through induction and mentoring programmes, ongoing professional development activities, student assessments, and collaboration with colleagues. The publication also discusses the importance of involving all stakeholders – especially teachers – in the process of education reform. What knowledge, skills and character qualities do successful teachers require? What policies can help teachers acquire the knowledge and skills they need? What can governments do to implement education policies effectively? From 3-4 March 2016, Germany will be hosting the 6th International Summit on the Teaching Profession (ISTP) in Berlin. Since its inaugural edition in 2011 in New York City, the ISTP has become an important forum for open and constructive exchange on effective teacher policies and practice. It assembles governments and teacher organisations from a number of high-performing and rapidly improving school systems, as certified by recent results of the Programme for International Student Assessment (PISA).